Introvert, Ambivert, Extrovert, Which Personality is Riskier of Gadget Addiction? 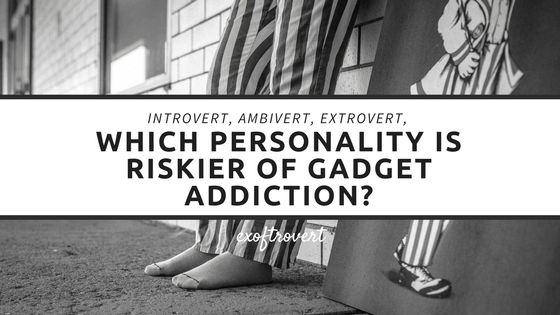 - Ex of Introvert Introvert, Ambivert, Extrovert, Which Personality is Riskier of Gadget Addiction? Introvert, Ambivert, Extrovert, Which Personality is Riskier of Gadget Addiction? - Nowadays, almost everyone is using technology and gadgets to support daily activities. It is true that with gadgets, our daily activities will become easier. However, consciously or not, this can cause negative effects and have a dangerous risk. This happens when we begin to get addicted to gadgets. There is a term called nomophobia, which is no mobile phobia, that is an excessive worry when we do not involve gadgets in everyday life. The features of nomophobia are as follows. Feel uncomfortable if not using gadgets. Feel reluctant to do something if not using gadgets. Using gadgets while you're eating. Prefers to interact with others using gadgets. Checking the gadget in the middle of the night. Still using the gadget when there are other things more productive to do. If you feel most of the parts of the above characteristics, then you may start worrying that you are starting to get addicted to gadgets. Or more easily, you can see the intensity of charging your gadget's battery. Actual gadgets can be used all day for phone, messaging, and reasonable internet access. So generally, and normally, people will recharge their gadget once or twice a day. No matter what age or what work, anyone can get addicted to gadgets and experience side effects. As for some side effects that may appear, is. 1. Effects of decreased organ function. This condition is characterized by a direct impact on the eyes that feel tired, visions fade, even itchy or hot. The effect can also be directed by a sore neck for too long staring at the gadget. Or just the occurrence of traffic accidents due to lack of vigilance when using the gadget when driving. 2. Psychological effects. The main problem of gadget addiction is the declining quality of sleep. In fact, at a more serious level, gadget addiction can cause serious problems, such as personality disorders such as schizoid personality disorder, antisocial, borderline personality, histrionic personality, dependency, obsessive-compulsive, and narcissistic. Although it looks trivial and audible-there is, in fact, the personality and psychology of a person can be changed with long-term repetitive impulses. Since the symptoms of this personality disorder are psychic, the main handler is a psychological approach. The cultivation of the understanding that the gadget only makes it easy to reach the information is needed. Here are tips you can do to reduce your use and addiction to gadgets. Set the time of use of the gadget, for example just until your work time runs out. Make your nighttime valuable by spending time with family. Do not use gadgets while eating, whether eating with colleagues, relatives, or your spouse. Create a gadget-free area at home, such as bathrooms, kitchens, workspaces, and bedrooms. Not to operate gadgets while driving a vehicle, this can reduce the risk of traffic accidents due to flying your attention. What is interesting about this gadget addiction phenomenon, James A. Robert, Ph.D. has researched and found that someone who has a closed personality and prefer to be alone like an introvert, has the least risk of gadget addiction. The reason, those who introvert think gadgets are the most perfect means to connect them with the crowd. Extroverts have a greater chance. Home » Addiction » Ambivert » Ekstrovert » Gadget » Introvert » personality » » Introvert, Ambivert, Extrovert, Which Personality is Riskier of Gadget Addiction?